Think quick: what was the best film of 2012? Amour, Argo, Beasts of the Southern Wild, Django Unchained, Les Miserables, Life of Pi, Lincoln, Silver Linings Playbook or Zero Dark Thirty? This question will be decided tonight at the 85th annual Academy Awards. As you prepare your Oscars ballot and debate whether Seth MacFarlane will make a great host (is it just coincidence that he made a movie called Ted this year? 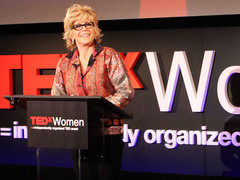 ), here is a celebration of TED speakers who have won Oscars. 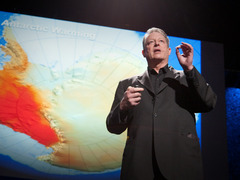 Al Gore: What comes after An Inconvenient Truth? Al Gore, who has given three TED Talks in total, won Best Documentary for An Inconvenient Truth in 2006. 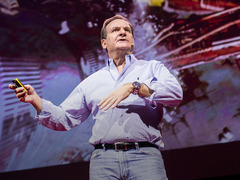 Three years later, at TED2009, he showed the latest climate data, revealing that damage to the planet was accelerating more quickly than expected. He also offered a potential solution: clean coal. Andrew Stanton: The clues to a great story Director Andrew Stanton won Best Animated Feature for WALL-E and Finding Nemo. 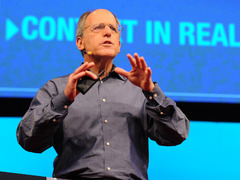 He also gave the talk “The clues to a great story” at TED2012. His bold idea: starting at the end and working back to the beginning. 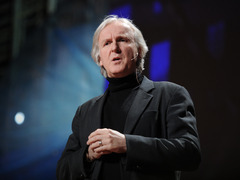 James Cameron: Before Avatar ... a curious boy James Cameron has been nominated for six Academy Awards and won three. Known for his ability to create engrossing worlds, in the talk “Before Avatar … a curious boy” at TED2010, Cameron shares why he has long been enthralled by the fantastic. 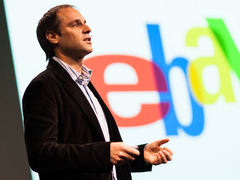 Jeff Skoll: My journey into movies that matter At TED 2007, Jeff Skoll gave us the one rule he has for picking projects to produce: that they must be movies that matter. Skoll’s film company, Participant Media, has made five Oscar winners, including Syriana, An Inconvenient Truth and The Help. Don Levy: A cinematic journey through visual effects Don Levy took us through a cinematic journey of visual effects with the help of the Academy of Motion Picture Arts and Sciences at TED2012. The head of marketing and public relations for Sony Pictures Imageworks, he led the awards campaigns for the studio’s first win, for the short The ChubbChubbs in 2003, through their win for Best Visual Effects for Spider-Man 2 in 2005. Producer Jake Eberts — known for taking on bold projects like Chariots of Fire, Gandhi, Dances with Wolves and March of the Penguins — has been involved with the making of movies that garnered 66 Oscar nominations, including nine Best Picture nominees. Eberts sadly passed away in 2012, but before his death, often showed film clips at TED — generally unposted because the footage was embargoed. Here, a recap of his talk from TED2009. 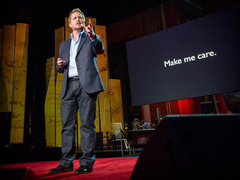 Morgan Spurlock, who gave the talk “The greatest TED Talk ever sold” at TED2011, was nominated for his documentary Super-Size Me. Composer James Horner won two Oscars for his work in Titanic, including Best Original Song for “My Heart Will Go On.” Horner desconstructed a scene from the epic film at TED2005. Jeffrey Katzenberg, founder and CEO of DreamWorks Animation, spoke several times at TED in the early days. His company made Beauty and the Beast, the first animated film to be nominated for Best Picture, and won Best Animated Feature Film in 2001 for Shrek. Producer Lawrence Bender, whose films have gotten 29 Academy Award nominations in total, has also spoken briefly at a TED. Ben Affleck, who created a playlist of his favorite TED Talks, directed and starred in Argo — nominated for seven awards this year, including Best Picture and Adapted Screenplay. Longtime TED community member Philipp Engelhorn got a Best Picture nod this year for Beasts of the Southern Wild, which he executive produced. FYI: Al Gore has never won an Oscar. Just viewed a Facebook posting of the heroic story of Irena Sendler who recently passed away at the age of 98. She smuggled Jewish babies and children to safety during the German occupation of Poland at great personal risk. She was finally caught and suffered broken legs and severe beating. The comments that followed included the expected acknowledgements of her bravery and also . . . anti Al Gore feelings. The fact that Al Gore won a Nobel prize and Irena Sendler did not, inspired anti Gore hate-speech. The people, who apparently sympathized with the Holocaust victims, used hate-speech to express their sentiments. It occurred to me that centuries of hate-speech is what ultimately led to the possibility of a Holocaust. 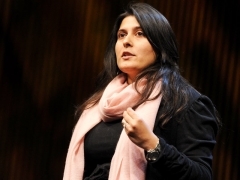 If I were Al Gore, I would consider making a movie about Irena which points out that she deserved Nobel recognition. The movie could point out hate-speech is also a form of pollution; cultural pollution. Perhaps Mr. Gore might associate himself with the creation of a little more intelligent discourse.